The East Texas Republican earned howls from Democrats when he accused a controversial FBI agent of lying under oath and brought up a well-documented extramarital affair in an open hearing. WASHINGTON - It's been a while since so many members of Congress were so visibly left with gaping mouths. U.S. Rep. Louie Gohmert – widely known around the Capitol as the most rabble-rousing Texan serving in Congress – unleashed a barrage of criticism at a controversial FBI agent in an open hearing that culminated in the Tyler Republican referencing the agent's extramarital affair. The incident came as FBI agent Peter Strzok testified in a joint hearing before Gohmert's U.S. House Judiciary Committee and the U.S. House Oversight & Government Reform Committee on Thursday afternoon. Strzok worked at the bureau on high-profile probes of both Hillary Clinton and Donald Trump. While other Republicans at the hearing were critical of Strzok, Gohmert went further. "I told some of the other guys, 'He is really good. He's lying. He knows we know he's lying, and he could probably pass a polygraph,'" Gohmert said, earning interjection from U.S. Rep. David Cicilline, a Rhode Island Democrat. "I've talked to FBI agents around the country," he said. "You've embarrassed them. You've embarrassed yourself. I can't help but wonder when I see you looking there, with a little smirk, how many times did you look so innocent into your wife's eye and lie to her about Lisa —" Gohmert was then cut off by the howls from Democratic members, which included one encouraging Gohmert to take "medication." The audible interjection from Democrats was a rare breach of decorum within the formality of Congress. All of the hearing's drama is rooted in a series of events from investigations pertaining to the last presidential campaign. Strzok was at the center of the FBI investigation into former Secretary of State Hillary Clinton's use of a private email server and, later, an investigation into whether the Donald Trump presidential campaign had connections with Russia. Special Counsel Robert Mueller dismissed Strzok from his ongoing Russia investigation last year once texts between Strzok and another FBI official came to light. The pair were engaged in an extramarital affair and traded disparaging comments about then-candidate Trump. After Congress became aware of the texts, the two FBI officials became political lightning rods in American politics and, among Republicans, evidence that the bureau is biased against Trump. 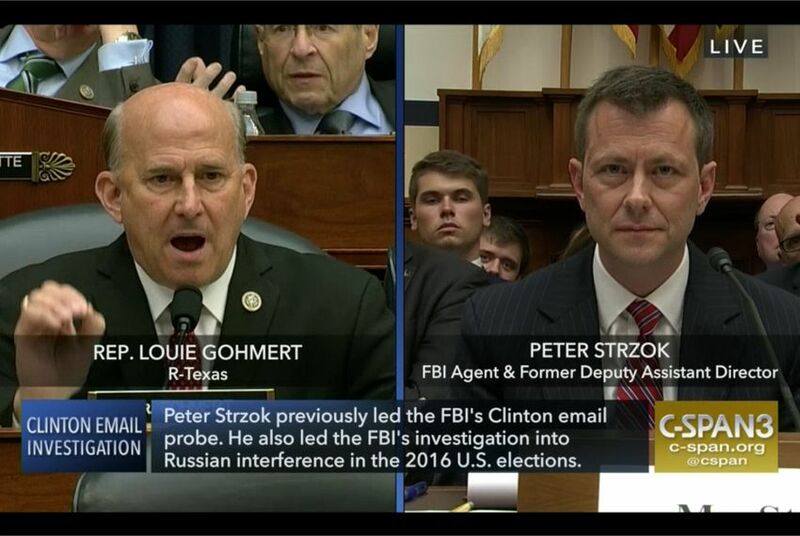 At the hearing, Strzok attempted to reply to Gohmert's allegations but Gohmert cut him off. "I assure you, under oath, as I spoke also during my interview a week or two ago, I have always told the truth," Strzok said. "The fact that you would accuse me otherwise, the fact that you would question whether or not that was the sort of look I would engage with in a family member who I have acknowledged hurting, goes more to a discussion about your character and what you stand for, and what was going inside--"
Gohmert spoke over him with a repeated refrain: "It goes to your credibility."